I’ve raced the Barry-Roubaix Gravel Road Race in Hastings, MI on three occasions. 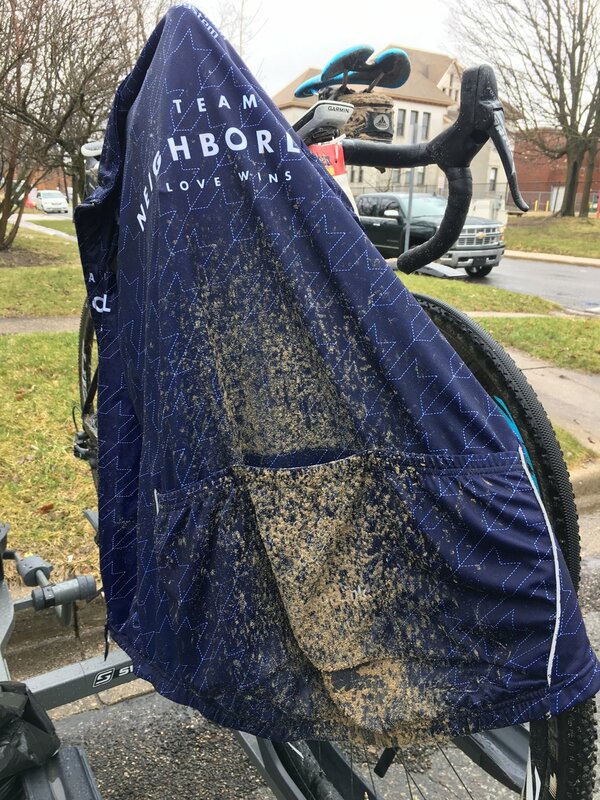 The first time was bitter cold and I was on a heavy mountain bike. The second time was last year in near perfect conditions on my cross bike. The third time was (as of writing this) five days ago again on my cross bike. Each time it has been the 36-mile race. In the week leading up to the race this year, every time I checked the weather report the conditions worsened. First 50 degrees with a chance of rain, then 45, then 40. The day of the race the temperature is 34 degrees with a 100% chance of rain. I wasn’t sure how to dress for these conditions. I had already resigned to the fact it’s going to be wet. I opted for knee warmers, arm warmers, a base layer, neck buff, shoe covers, and wind vest in addition to normal bibs and jersey. I ran a Challenge Grifo for the rear tire and a Challenge Chicane for the front; both tires around 50lbs of pressure. The race started out wet, with no rain. Then around nine miles in, the sky opened up and let loose a downpour. Soaked, I could feel the water flowing down my legs, under my shoe covers and into my shoes. On a paved descent a few miles after the rain began, it felt like needles on my shins as I descended at 36mph. After that I wasn’t as cold. I maintained my pace, watched my power output and heart rate in an attempt to not implode ¾ of the way through the race. I kept waiting for the hardest section of the course, Sager Rd. In 2016 it was sand pit after sand pit that was more reminiscent of a cyclocross race than a gravel road race. Unbeknownst to me, Sager Rd. had been removed from the course due to the weather conditions. I was actually happy when I rode up to “the Wall”, one of the steepest climbs on the course. This is when I realized Sager Rd. was out and I was feeling surprisingly good despite the cold and rain. After suffering through the final climbs and transitioning from gravel to pavement for the final time, a pace line sped past me and I was able to sit on the last wheel of the group. I stuck with this group through the finish. My hands and feet were numb and I was soaking wet, covered in sand. Last year I felt like the beginning of the race had my heart rate up quick. This time, I tried to pace myself at the beginning and let loose the closer I got to the finish. I was surprised to find out that my highest power output for the race was the first 20min., and I averaged 230 watts over 2 hours 18 minutes 1 second. This is my highest average since training with power. After comparing times between 2016 and 2017, I finished 25th out of 60 men age 35-37, 17 seconds faster this year in probably the worst conditions I have ever raced. I’m happy with that.